The specific discourses of film aesthetics, visual studies, and critical history form central points of reference for the films and photo series of Vienna-based artist Hannes Böck. 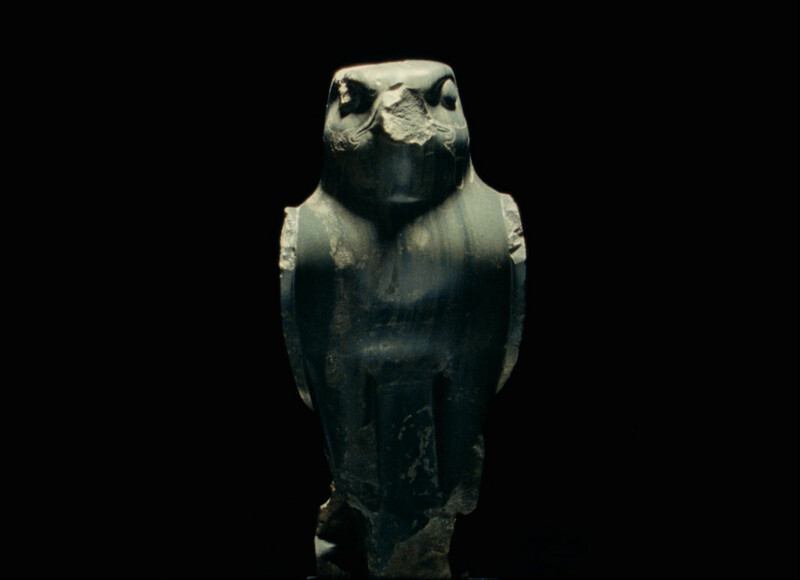 For his solo exhibition in the Grafisches Kabinett at Secession, he has produced a new 16-mm film that addresses the complex relationship between archaeology, art history, photography, and their respective visual languages. His work is as much informed by cultural and postcolonial debates about the various mechanisms of inclusion and exclusion that help establish hegemonic historiography, as it is inspired by self-reflexive considerations on the nature of film, photography, and image production. Fünf Skulpturen aus den ägyptischen Heiligtümern im Museo del Sannio, Benevento: n. 252 Hockender Pavian, Diorit; n. 253 Falke, Amphibolit; n. 255 Falke, Gabbro; n. 256 Hockender Pavian, Diorit; n. 280 Apis-Stier, Diorit*, produced specially for Secession, shows sculptures made of dark-colored stone, images of Egyptian gods that were used for cult purposes in an Ancient Roman temple of Isis. The title provides information of the sort found in museum ordering systems and which visitors might find on a museum label. 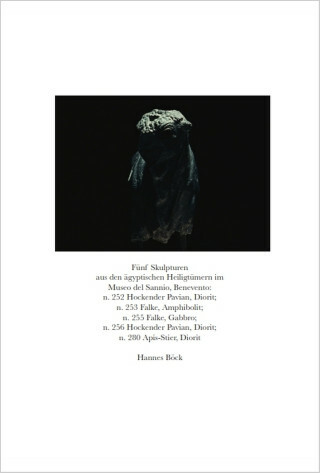 Hannes Böck lifts the five sculptures, which are on permanent display in the Museo del Sannio in Benevento, out of their classical museum-display context by showing them set individually against a black background. The figures, brightly lit and shot in high contrast, are shown from five camera angles: long shot, medium-long shot, profile, sideways from behind, and close-up. Böck’s thematic starting point is the deliberate neglect, since the Enlightenment, of the importance of Egyptian culture for the development of the western world, in favor of an origin myth that anchors the birth of the western world in the Greco-Roman tradition. 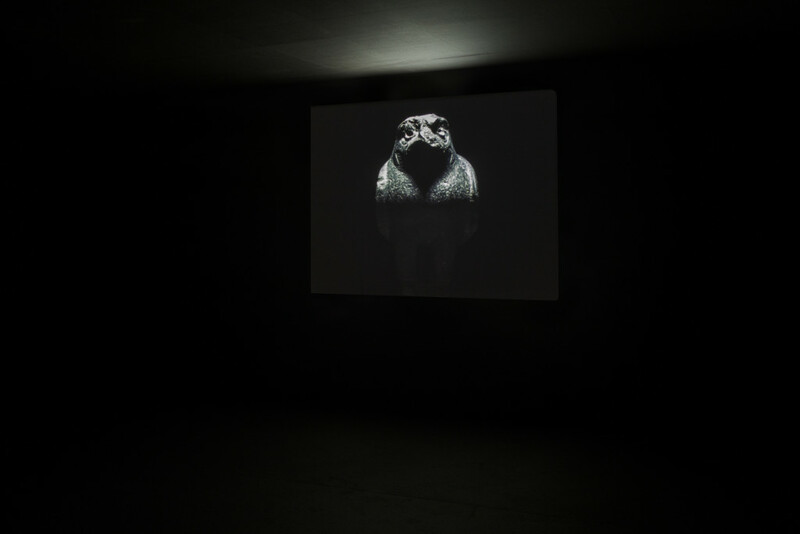 His film points to the ambiguous role of photography in relation to the dissemination of archaeological and art historical findings, and to the complex mechanisms of inclusion and exclusion that support an homogeneous and linear writing of history. On an aesthetic level, in Fünf Skulpturen… Böck plays with the correlations between photography and film as well as the basic conditions of artistic film within the context of fine art. The most notable references to photography are the lack of audio, the static shots, and the extremely slow cutting. The editing borrows from structural film in its adherence to a strict grid, and the lack of audio shifts the attention entirely to the image level. The decision to shoot on color material in a film which initially looks black-and-white, is a reflection on the visual characteristics and historical uses of analogue film and photographic technology in the age of digital cinematography. A third factor, in addition to the cross-references with regard to the aesthetics and content of the film, is its presentation as a loop in a black box. The way films are presented in the exhibition space is an integral part of film art and thus critically important. This black box, an architecturally ambiguous construction of black fabric stretched on a frame, creates an illusionistic, hypnotic viewing space. It also contains the cinematic apparatus and serves to make the room behind it disappear. Although Böck has created an illusionistic space in which to show Fünf Skulpturen…, the film demands active participation from the viewers, who have to decide for themselves how far they are prepared to enter the work and attempt to decipher it. 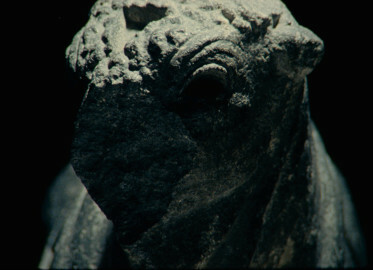 In earlier works such as Las Encantadas (2012), Niches Cut into Bedrock at Sacsayhuamán, Cusco and Inca Stone Quarry at Cachicata, Ollantaytambo (2011), or New Hefei (2007/8), which were filmed in the Galapagos Islands, Peru, and China, Böck’s interest lies in the reciprocal and diverse effects of the economic, political, and cultural links between Europe and non-European cultures, and how these can be translated into images. The film Las Encantadas (2012) takes as its starting point a fragment of a novel by Herman Melville, in which the author questions both Spanish colonial politics and the natural sciences’ claim to truth. The protagonist of one episode in this book, an indigenous female Robinson Crusoe figure, is replaced in Böck’s script by the figure of an actress, who remains absent in the film but appears in the accompanying photo series of the filmset of a Mexican telenovela. The film shows segments of a landscape in twelve shots filmed with a static camera; it could be interpreted as a topographic study or else a critical examination of the visual aspects of colonial occupation and settlement of land, but could just as well document a preparatory phase of a film shoot. Niches Cut into Bedrock at Sacsayhuamán, Cusco and Inca Stone Quarry at Cachicata, Ollantaytambo (2011) looks, at first glance, like a structuralist study on abstract form and film editing, were it not for the references in the title to Inca culture, which establish a frame of reference to themes such as cultural identity, emancipation, and archaeology in the context of postcolonialism. New Hefei (2007/2008) shows the impact of media images on the collective memory and how these images can become a measure of our perception of reality. The film focuses on the construction boom in the Chinese provincial capital Hefei in the wake of the Chinese economic miracle. Böck adopts the visual language of Italian (post) neorealism, specifically Antonioni’s La Notte, to draw a visual parallel with the Italian economic boom following World War II. On a technical level the film effects a rolereversal of actor and location. Only at the end does it become clear that the protagonist has actually led us to the various places in the film, and that these do not simply function, as is usually the case, as a backdrop for the storyline. Hannes Böck, born in Vienna in 1974, lives and works in Vienna.